The National Hockey League is citing as a legal precedent a lawsuit filed in the wake of the Columbine High School massacre in 1999 to try to dismiss a claim filed by the family of former enforcer Derek Boogaard. In a motion to dismiss the Boogaard lawsuit, the NHL argues it cannot be sued for promoting and marketing violence because it is protected by the U.S. Constitution’s First Amendment protecting free speech. That same argument was successfully made in 2001 by Acclaim Entertainment Inc., the maker of the Mortal Kombat video game, after Columbine, the NHL said in its court motion, filed Nov. 4 in U.S. federal court in Chicago. The NHL also argues in its motion that the league does not have a duty to share with players the findings of any of its research into the long-term impacts of concussions. An NHL spokesman did not respond to an email seeking comment. After earlier granting the NHL’s motion for summary judgment dismissing the Boogaard claim, a federal judge in September allowed Boogaard’s father, Len Boogaard, to file an amended claim against the NHL. 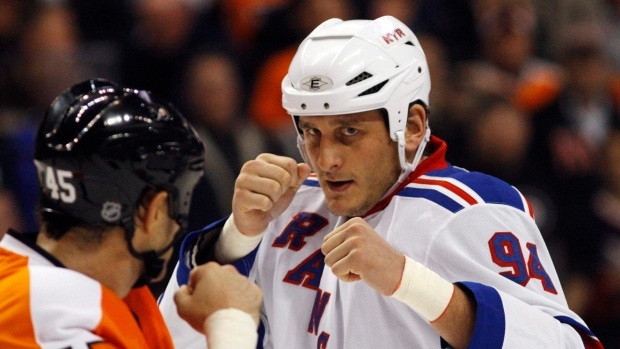 A former on-ice enforcer with the Minnesota Wild and New York Rangers, Boogaard died on May 13, 2011, of a drug overdose. Len Boogaard alleges in his lawsuit that the NHL is responsible for his son’s death because the league cultivated a culture of violence that led to Boogaard getting into fights. He says those fights caused his son to develop brain damage and an addiction to opioids, which in turn led to his death. The federal judge in September ruled that Boogaard’s claim – that the NHL unreasonably harmed his son – is viable under state law in Illinois and Minnesota and is not pre-empted by the NHL’s collective bargaining agreement. In a motion asking the court to reconsider its September ruling, the NHL argued the U.S. Constitution’s First Amendment protecting free speech safeguards the league’s ability to promote and market violence. The NHL cited as a precedent a lawsuit filed following the deadly Columbine High School murders in Colorado on Apr. 20, 1999. After two killers murdered 13 students and one teacher, William David Sanders, at Columbine High School, Sanders’ widow, Linda, filed a lawsuit against Acclaim Entertainment Inc. While Linda Sanders alleged that Acclaim’s design and marketing of Mortal Kombat inspired the murderers, a federal judge dismissed her case, citing Acclaim’s right to free expression. “Even if Boogaard could surmount the First Amendment obstacle, there are simply no plausible facts alleged to support his theory that his fights with other NHL players, which in turn caused him to develop CTE and an addiction to opioids, which in turn caused his death, were the foreseeable result of the NHL producing content that depicted violence in hockey,” the NHL’s lawyers wrote. The NHL also disagreed that it had a responsibility to share any of its findings about the long-term risk of concussions with players. Emails disclosed in a separate class-action lawsuit filed by players against the NHL show that after forming a concussion study in 1997, the NHL in 2007 quietly abandoned the study. League officials noted in internal emails that doctors involved had not analyzed any data because the NHL had not paid them. The NHL reformed its study group under a new name, the NHL/NHLPA Concussion Working Group. “Even if the NHL assumed a duty to study the long-term effects of concussions, that duty was limited to using reasonable care in the study itself. To the extent there was any duty of care, it did not include a duty of disclosure to Boogaard or others,” the league wrote in its Nov. 4 filing. William Gibbs, a lawyer with the Chicago law firm Corboy & Demetrio who is representing Boogaard, declined to comment. In a separate complaint filed in California with state medical regulators, Len Boogaard alleges his son failed 14 of 19 drug tests during the final six months of his life without any consequences. Court documents indicate doctors prescribed Derek Boogaard with 1,021 pills during the 2008-09 season alone. The NHL and NHLPA commissioned a third-party review after Boogaard’s death and are discussing changes to the joint Substance Abuse and Behavioural Health Program (SABH).